Last month the US carrier AT&T announced a new Rollover Data plan for all of their existing customers. The plan basically gives you the unused data from your last month and rolls those gigabytes over to the current month. The plan started taking effect for customers on January 25, 2014 and if your billing cycle has happened since then, you have Rollover Data on your account. By-the-way, there is no sign up process for this features. It is for every AT&T customer who has a qualifying plan which is all of the monthly billing plans. As part of that announcement, AT&T indicated that the myAT&T app for Windows Phone, iOS and Android would all be updated to reflect this rollover data. That is now in the app which you can download for free from the Windows Phone Store. promised, you can now view your current billing cycle in the app and the amount of data that rolled over from the previous month is indicated in your amount of data available. This number will be added to your normally monthly allowance on your plan to give you a total of included data for the current billing cycle. In my case, I have the 30GB plan from AT&T (15GB with a free 15GB promotion they were running back in the holidays). Added to that in my case was an additional 23.98GB that I did not use last month. So for the rest of my current billing cycle I have 53.98GB of data left to consume. 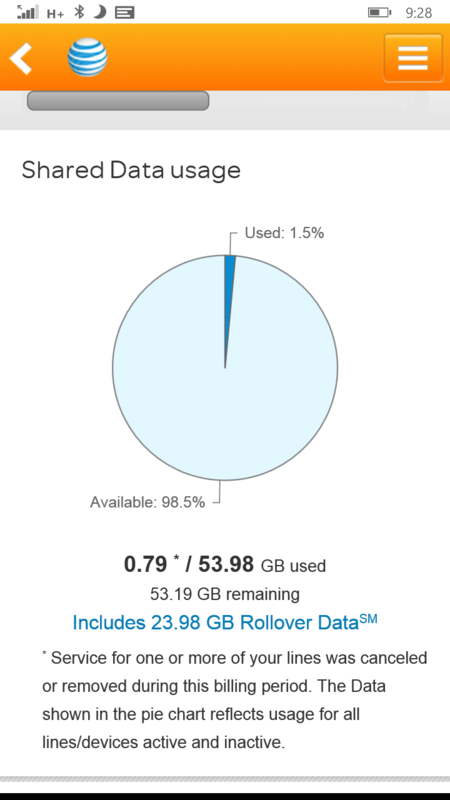 Whatever I don’t consume of that 53.98GB this month will again be rolled over to my next billing cycle. In a world where carriers tend to nickel-and-dime you to death, this Rollover Data feature is actually a great thing for consumers on AT&T. Effectively it has ended any worries I have about overages as I travel or how much I (or my daughter) decides to stream Netflix while on-the-go. While I cannot ever see me using this much data in a month given WiFi access is just about everywhere I go, it is nice to know it is one less worry when the bill comes in each month to my email inbox. If you are an AT&T customer and haven’t tried out the myAT&T app, it is a great little app for checking your balance, paying your bill and seeing your monthly voice, data and text usage. Now, about that Lumia Denim update AT&T?